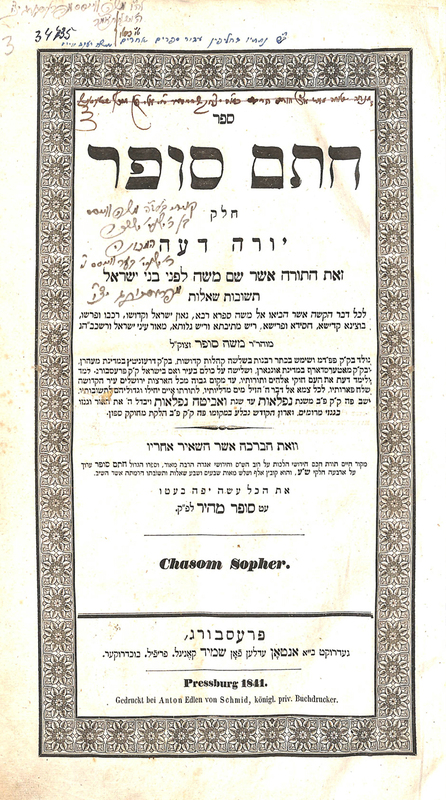 On the passing of the Chasam Sofer in 1840, his sons and disciples undertook to publish his novella. Although the Chasam Sofer wrote extensively on many facets of the Torah, he was particular that his teachings should not be published in his lifetime. It was decided that the first to be printed should be the Halachic responsa on Yore Deah. With an important introduction by R. Shimon Sofer of Krakow entitled Pituchei Chosam. 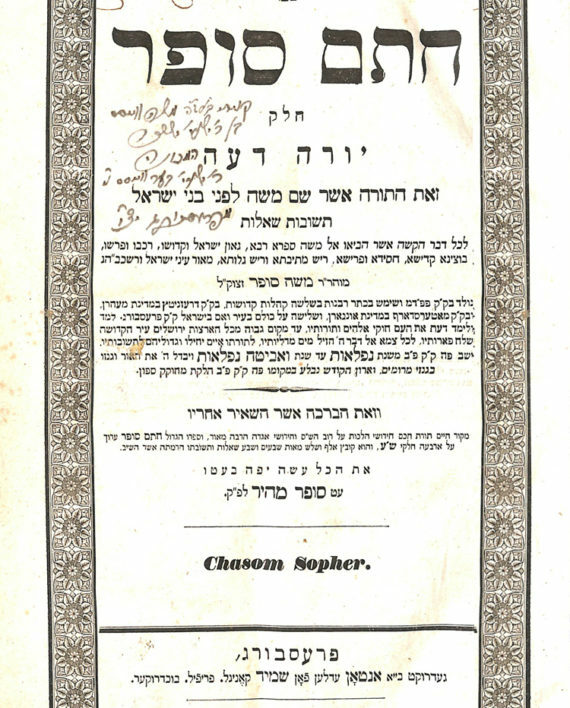 With signature and glosses of R. Moshe Weiss of Pressburg (1861-1936) distinguished disciple of the Shevet Sofer. Known as a Talmid Chochom, he founded a Chevra to which he taught Torah. Brother of R. Shabse Sheftel Weiss (Rav of Shimanya) and R. Yitzchok Weiss (Rosh Beth Din of Verbau). Vinograd Pressburg 46. Schmidt press. 4, 153, 6 pages (Mispaginated) 38.2 cm. Fine condition, some staining, one small hole affecting text. וינוגרד פרשבורג 46.דפוס שמידט 4, 153, 6 עמודים (מספור עמודים שגוי) 38.2 ס”מ. מצב טוב, מעט כתמים, חור קטן אחד הפוגע בטקסט.